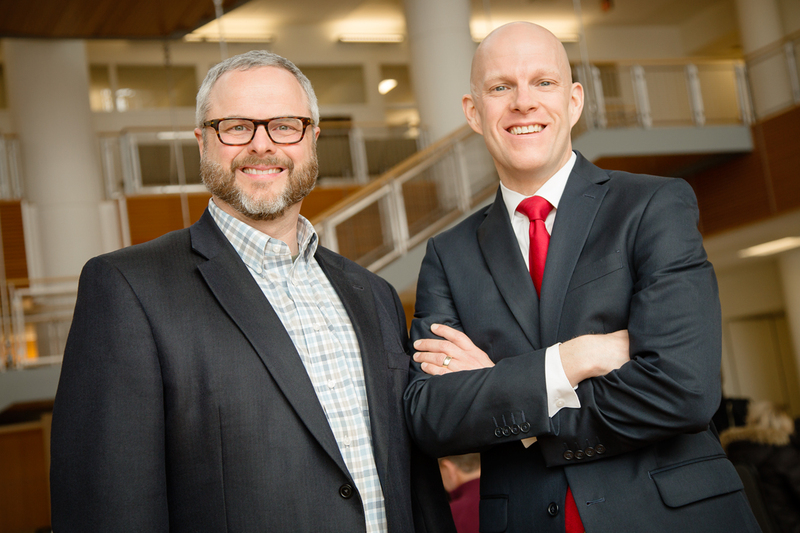 A simple cue can trigger a marked increase in fraud detection among veteran auditors, says a new study co-written by business professors Jessen L. Hobson, right, and Mark Peecher. CHAMPAIGN, Ill. — A new study co-written by a pair of University of Illinois experts in audit and financial accounting finds that a simple cue can trigger a sizable increase in fraud detection among experienced auditors. Research from Mark Peecher and Jessen L. Hobson of the College of Business finds evidence that experienced auditors’ judgments about deception are less accurate for companies later linked to fraud, regulator investigation or class-action litigation unless they are first instructed to look for signs of guilt in the CEO’s voice. “Deception detection is very difficult. Most people have trouble figuring out when someone is deceiving them,” said Peecher, the Deloitte Professor of Accountancy and associate dean of faculty at the College of Business. “The good news here is that very experienced auditors, who are hired because they’re supposed to be watchdogs for society, actually have the capacity to discern when upper management is being deceptive. The researchers compiled 124 judgments from 31 very experienced auditors from multiple accounting firms. Each participant provided deception judgments for four publicly traded companies, using excerpted CEO responses to analyst questions during quarterly conference calls. Software randomly drew excerpts from a population of five fraud and five nonfraud companies, with the expectation that participating auditors would spot fraud accurately 50 percent of the time by chance alone. For each company, auditors also received background information and financial statements. While reviewing CEO answers to analyst questions, auditors decided whether they thought the financial results being discussed were fraudulent. Peecher and Hobson found that accuracy levels for accurately spotting fraud improved from 43 percent to 70 percent when veteran auditors were given instructions to look for signs of “negative affect” during CEO narratives from conference calls. The instruction had the effect of shattering the auditors’ subconscious “illusion of objectivity” that otherwise enables them to downplay fraud cues, according to the paper. Audit students doing the same experiment and prompted the same way are “still unable to find fraud and perform no better than chance. You see no improvement,” Peecher said. “For all those reasons, we think that very experienced auditors subconsciously try to avoid false positives, which is why they may need a little encouragement to detect deception,” Hobson said. Co-written by William J. Mayew and Mohan Venkatachalam of the Fuqua School of Business at Duke University, the paper was the recipient of the 2016-17 Glen McLaughlin Prize for Research in Accounting Ethics from the Steed School of Accounting at the University of Oklahoma. Editor’s notes: To contact Mark Peecher, call 217-333-4542; email peecher@illinois. To contact Jessen L. Hobson, call 217-265-0327; email jlhobson@illinois.edu. The paper “Improving Experienced Auditors’ Detection of Deception in CEO Narratives” is available online.